Gwen Smith's tagline on her website says her purpose is "helping women know and trust God more". After today's episode of Thriving Beyond Belief, you will have no doubt that is what God has intended for her to do! Gwen is a delight, an 8w7 on the enneagram (if you know what that is) :), and has such an amazing story to tell. Not only is Gwen a follower of Jesus, wife, and mother, she is also an author, speaker, podcaster, and coach. Gwen's story is one where she is able to personally speak about the goodness, grace, and faithfulness of God. She speaks of young love, heartbreak, and amazingly beautiful redemption. I don't want to give away her whole story here, but it's one that has her cling to the story of the prodigal son from Scripture. She shares what she describes as her "mess-timony", and the fact that our sin is never going to be bigger than God's grace in our life. We cannot outdo the power of the cross! Once Gwen returned to the Lord, she spent so much time trying to "earn" her way back into the good graces of the Lord. She volunteered for every role she could in the church, trying to work her way back into the arms of the Lord, until she realized she was already there. Christ then revealed to her that in the midst of trying to earn her salvation, she stopped dreaming about what the Lord was going to do in her life. She felt "disqualified" from the race. How many of us can relate to feeling this way from time to time? But in His goodness, God showed her the grace that was given to her, the fact that we can never earn our salvation, and that with thriving ALWAYS comes honesty about our story. I love how she reminds us that His arms are never too short to save and His ears are never too dull to hear. We talk about Gwen's definition of thriving. One thing that stuck out to me about what she had to share was that she always referred to herself as someone who was "dizzy". She loved to spin in circles as a girl, and that same mindset carried into adulthood. But she claims that this leads to chaos and it keeps our eyes from ever looking forward. Gwen believes thriving is being able to look straight ahead to eternity and to keep from spinning in mindless directions. We even cope together as we discuss the season of empty nesting, bond over being fellow podcasters, and discuss how the Lord truly uses all of our mess to create something beautiful and new. I cannot wait for you to take a listen today! I'm super excited to have Jessica Smartt with me today on the Thriving Beyond Belief podcast! Jessica Smartt is a former English teacher turned homeschooling mama of three. A week after her first baby was born, she began her motherhood blog, Smartter Each Day. Jessica and her husband live in beautiful North Carolina, where she loves hikes with kids(mostly), steaming coffee in the afternoon, family bike rides, and anything that's ever been done to a potato. I love Jessica's heart behind this book and what came about for her to write it. She reminds us that celebrations are not man-created, but something the Lord created. We see biblically that there are festivals and events to remember what the Lord had done. We should do the same thing in our lives today, celebrating those moments that the Lord is faithful in our lives. Celebrations are a blessing from the Lord and something to embrace in our everyday lives! Comparison and competitiveness are some other topics we discuss in the sense of motherhood. Our culture, with the influence of social media, has led to comparison in the circles of women and mothers. Jessica discusses how to make things special in your own home without the burden of trying to keep up with others. She beautifully reminds us of the point: that we are to do everything in our lives with our focus on the Lord. The point of these celebrations is not to make your calendars busier or more hectic, but for them to be a genuine time of enjoying your family and celebrating what the Lord has done in a special way. Jessica will be the first one to tell you that her and her family's life is anything but calm! In fact, all of what the Lord has laid on her heart about taking time to celebrate came from a season of busyness that left her family not seeing the Lord in the everyday moments. She felt the Lord telling her then and there to slow down and be able to see Him in the small moments of their lives. Jessica and her family still live in this fast-paced world like everyone else, and still have busy schedules. But they have taken on some traditions that are special to their family and have chosen to keep those sacred. What’s the solution to gaining the balanced, meaningful life you desire with your family? Create traditions that bring joy and significance.Popular "Smartter Each Day" blogger and mom of three, Jessica Smartt explains in her book, Memory-Making Mom: Building Traditions That Breathe Life Into Your Home She also offers practical encouragement to modern parents to keep on adventuring—even when they are fighting distractions, are on a budget, and exhausted. I loved today's episode because of the intentionality in which Jessica lives her life! I hope it inspires you to do the same in your own family! Today I am thrilled to have Melanie Dale on the podcast with me today! Melanie's life has been anything but what she expected- leading her to a ministry opportunity she never would have imagined for herself. Thus, her first book and website are entitled"Unexpected". Melanie pictured her life going as most of us do- getting married, having children, etc. But after a battle with infertility, Melanie realized the Lord had more in store for her life than she knew. We discuss major issues today that are all separate but all connected at the same time- marriage, intimacy, infertility, and parenting to name a few. Melanie discusses how her new saying is sur-thriving. She believes that life is never going to get to a place where everything is perfect, so we need to learn to thrive while we survive! We really tackle the difficult issue of not being able to bear children, and what avenues come from that in people's lives. One of Melanie's books was written intentionally in the midst of a storm in her life, so that she could claim the goodness of the Lord in the middle of the unknown. So often, we see people who discuss their issues after they have seen redemption in their lives. But we sometimes need to know what to do and what to pray in the middle of an issue where we do not know the outcome. Melanie's sincerity, vibrancy, and authenticity are truly refreshing in a world that tries so much to cover up failures and hardships. Melanie gives some great advice on intentionality in marriage, how to build authentic friendships with other women in a similar life stage, how to balance the many hats most of us are wearing, and how to do it all with originality and a little humor! 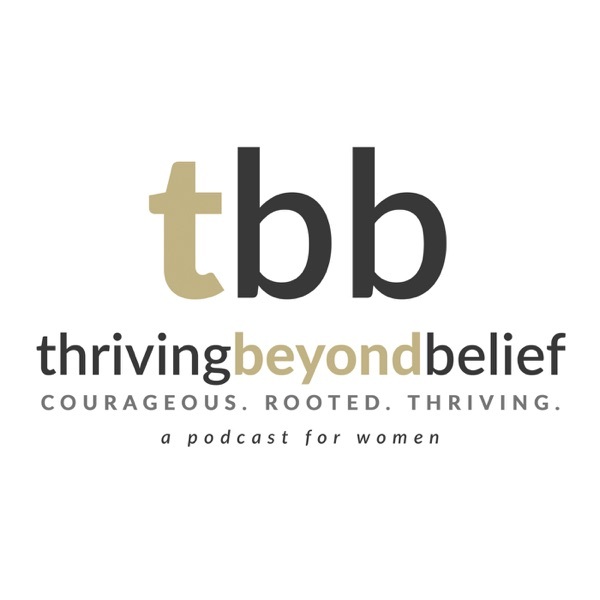 I am so thankful to have spent today's episode of Thriving Beyond Belief with Melanie, and I hope you are able to face the unexpected with ferocity, vulnerability, and to be able to laugh as you go.